As blizzards cross the nation making our roads and highways slick, slippery and treacherous traps, effective and easy to install snow socks from ISSE can solve the traction troubles of winter’s inclement conditions. "We all know that helpless feeling when your car is stuck and the wheels are spinning," said Diana Mini, founder and CEO of Shark Industries, the company bringing Snow Socks to the United States. "Families with small children, young drivers and anyone driving in a winter climate should add Snow Socks to their car's winter survival kit. They really are as easy to use as slipping socks on, getting drivers back on the road in just minutes." The Snow Socks fabric consists of a woven Polyolefin material, commonly used on offshore oil platforms, that provides renewed traction thanks to the highly resistant fibers on ice and snow. Polyolefin is a polymer such as polyethylene or polypropylene. The fabric wicks away water providing a better grip on wintry surfaces. Snow Socks fit most passenger vehicle tires, especially those with a lower ground clearance, like sports cars and sedans. With no tools required, a driver simply slides the socks over the car’s drive tires. Then moving the car up a couple of feet, the other side is pulled up. From that point the Snow Socks align themselves on the tires. Since the socks weigh less than two pounds, taking up little space, they can kept in the available carrying case and stored in the trunk or cargo area of a vehicle. They have been in use in Europe for the last couple of years, but now thanks to Shark Industries they are available in the US, where recent weather certainly warrants them. Besides, chains are heavy not to mention difficult and time consuming to put on. ISSE Snow Socks come in two different styles. The Classic Snow Socks are only $99 and are handy for occasional on snow. The Super Snow Socks have a thicker fabric suitable for more intensive use in snow and icy conditions and are priced at $149. To order the proper size, just make a note of the tire width, profile and rim size (on the side of the tire) into an online calculator. Snow Socks are also available at Amazon.com or directly from Shark Industries at trysnowsocks.com. can't help but think these socks would be worn out in a day or lost along the side of the road. sorry, i'm skeptical about their practicality. i live in minnesota where driving on snow is not an occasional thing. 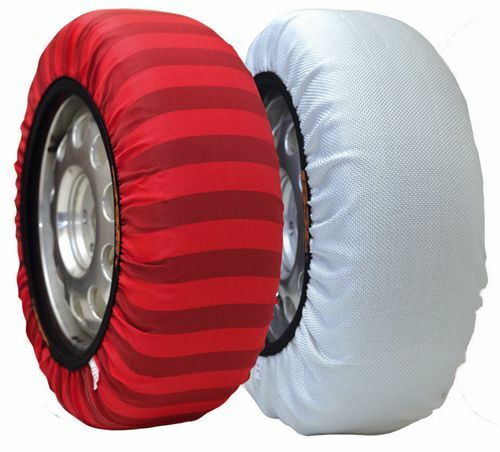 These would be awesome for second cars like convertibles and sports cars that are kept primarily for dry days and have summer only perfomance tires, but which need to sometimes be used in winter. Thumbs up.